LG enters the ring with a powerhouse battery. 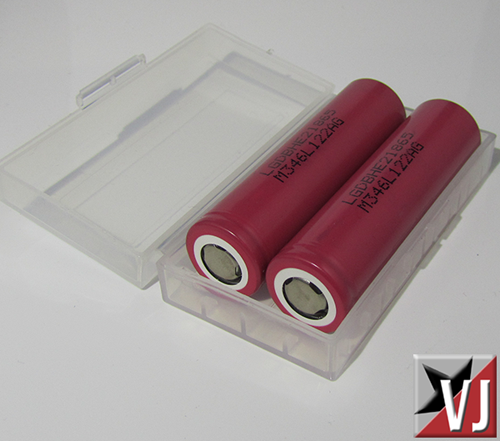 These are the LG IMR18650 Batteries. The brand name is the 18650HE2. Some are saying these are what EFEST uses on their 35A batteries, but no one knows for sure. What is known is these are safe chemistry, peak 35A, and 2500mAh. These come with a battery case (nice touch). Congrevape states these have been tested to 50A without a fail – thought I wouldn’t recommend doing it. There have been questions about this batteries Chemistry because some have listed it as ICR. These are Li-[NiMnCo]02 – which includes Nickle/Manganese/Cobalt. This is a Hybrid chemistry much like Panasonic batteries.